I love garland!! Its such a cheap easy way to make any room look happy! I even a have a Pinterest board dedicated to Banners, Garland and Wreaths. While at Walmart the other day, I picked up a bundle of fat quarters full of lovely spring colors...I then went home and started cutting...Okay two weeks later I started cutting. I just make a small cut so I could tear the fabric into 1" strips. I went the full length of the fat quarter and then cut each strip in half...mind you these measurements are all "about"...I seldom do anything exact. I also added some yellow, orange, green and of course burlap from my fabric stash...My house is not really a "pastel house"....but I wanted the pastel spring feel. I tied them onto a roll of twine...not cutting it off the roll until I had the desired length...because...of course...I wan't even sure where I was going to hang it...maybe the light above the table, on the mirror in the hallway, over the chalkboard, or the mantel (which is where it ended up). or a more messy one, like this one from Vintage Pretty. We then promptly hung it on the mantel...after trying it everywhere else. Well, that's it for this week and thanks for visiting! Yet again, I will be linking up to many of the parties on my side bar...do check them out. I love garlands too! 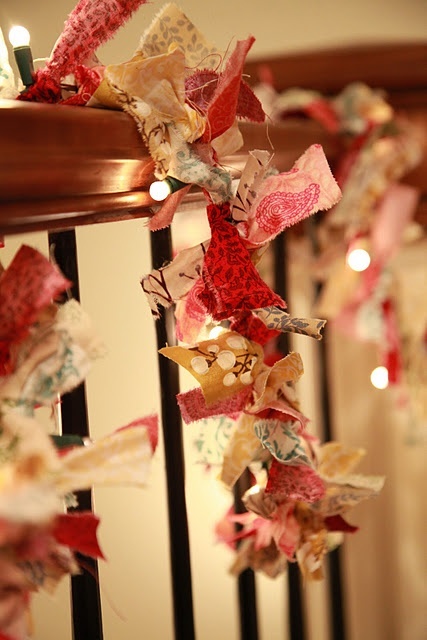 I have a bunch of vintage sheets that I would love to make a quilt with but they would be great as a garland too! Love it! The colors are my fave, thanks for sharing, love your blog!! I've been trying to figure out what to use as a backdrop for furniture pictures. And I stumbled upon your post. I have lots of leftover fabric, and will use that to make a garland! Thanks for inspiring me! What adorable garland Denise. Thank you sao much for sharing at SYS and enjoy the rest of your weekend! Fun pop of color Denise! I love garlands as well. I've made one like this using all burlap. Thanks for sharing with SYC.